This is a unique two-day Master Class that is dedicated to Artificial Intelligence. It will be run by two of the world’s foremost thinkers on AI, Calum Chace and Daniel Hulme. Mr. Calum Chace is a best selling author of several books on AI which include “Surviving AI” and ”The Economic Singularity” and is one of the leading thinkers on AI and its future impact on society and business. Dr. Daniel Hulme is the founder of one of UK’s leading AI companies – Satalia. He is a leading global business advisor on the field of AI and also advises the Dubai government on AI along with holding a PhD in AI. The focus on this Master Class would be to demystify AI, understand how it can affect your organization and how it will impact the business world in the near future. Predominantly in this Master Class, you will be taught how to best use AI technologies to your advantage and integrate it with your business strategy. 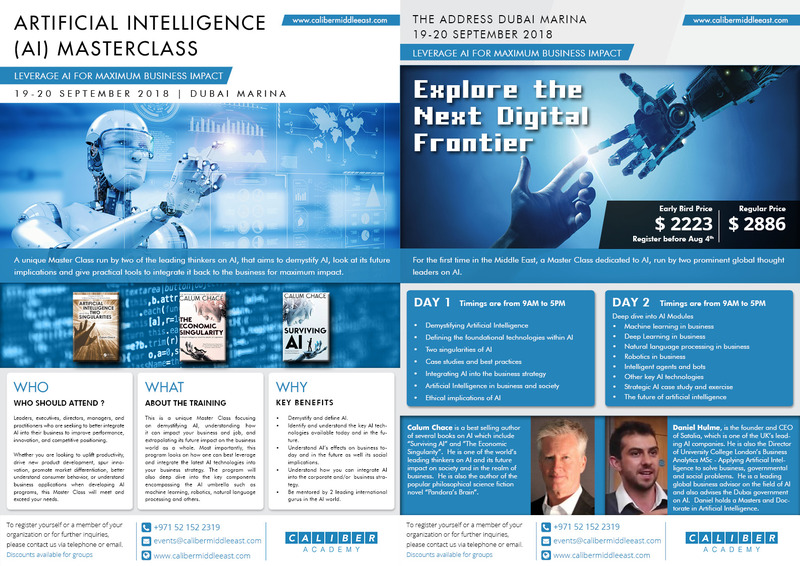 The Master Class will also cover key areas of AI in depth such as machine learning, robotics, NLP etc. Please view our company profile for more information on our services and expertise.